This Choral Recording by The Crossing, ZEALOT CANTICLES, Just Won a GRAMMY! Zealot Canticles was released on September 28, 2018. In their 2018 CD, The Crossing sings Lansing McLoskey's oratorio, Zealot Canticles: A Musical Plea for Tolerance. 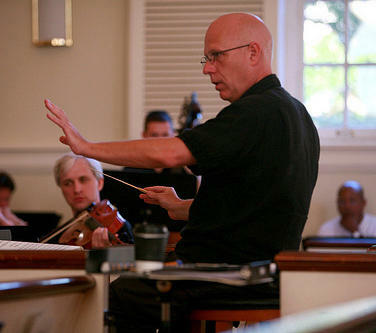 WRTI's Susan Lewis talks with The Crossing's conductor Donald Nally about the poetry, choral writing, and social issues that converge in this work. Lansing McLoskey's Zealot Canticles, an oratorio for clarinet, string quartet and 24-voice choir, is based on the poetry, speeches, and other writings of Nobel prize-winning Nigerian writer and human rights advocate Wole Soyinka. Born in 1934 in Nigeria, Soyinka was arrested in 1967 and imprisoned for 2 years for civil defiance after speaking out against genocide and human rights violations by Nigeria's ruling military dictatorship. In prison, he went on hunger strikes, endured stays in solitary confinement, and secretly wrote about his experience on scraps of paper, which later became his book, The Man Died. In Soyinka's Twelve Canticles for the Zealot, he uses poetry to explore the mind of the fanatic. The libretto of McLoskey's Zealot Canticles is based on 7 of these poems, interwoven with excerpts from The Man Died and other writings of Soyinka. Susan Lewis: This work was commissioned and premiered in March of 2017. Lansing McLoskey calls it an oratorio for tolerance on the writings of Wole Soyinka. What drew you to this composer? Donald Nally: I was having one of the many obsessions that I have; this obsession was about Wole Soyinka, about his writing about zealotry, and divisions in society, how we treat each other, and oppression. Soyinka was a playwright; and so there's a dramatic element, and there's a humorous element to his writing, and there's a violent element to his writing. I really liked the way in which he approaches this very difficult topic. How do you talk about zealotry without being a zealot, right? I had a commission in Cinncinati for a choir, and I wanted to work with a particular clarinetist. I went to Lansing [who had worked with The Crossing in 2010, writing music for organ and choir]. He set this 10 minute piece. At the premier in Cincinnati, I said, "I think you've got the makings of a major piece, like an oratorio for choir that's 70 minutes long and has a patchwork libretto of other Soyinka's texts, and what do you think?" And he said, "Yes! I'd love to write a full concert-length piece!" [Now] a number of years later, we have this big piece of music that doesn't really tell a narrative. It presents a lot of different types of writings on the same topic. So Lansing wrote a 10-minute piece based on the writings of Wole Soyinka. What was it about that music that made you see the connection to all of the different facets of this poet's writing - the drama, the violence, the humor? A number of reasons. One is the music itself. The Crossing doesn't like to have pieces written that answer the questions. We'd like to have pieces that ask the questions, or try to figure out what we should be asking each other. We're not in a position to be answering the questions. Soyinka's words present a lot of scenarios. Lansing found a way to make it so that the musical language was provocative, and at times, intangible. And yet, the harmonies of it created 'ear worms' for the singers. It got in [your head] and stayed inside it. At the same time, he used the clarinet as a character, and some of the writing in that first piece that wound up in the second piece. It had these really violent outbursts that were long dramatic moments for virtuosic clarinet. I felt as if it was what was going on in Soyinka's head - that cry of "Why?" It was the combination of what Lansing had to say about the words and the words themselves that made me think, "This is just the beginning of something that talks about a topic that is important in the world. The topic of zealotry ... And the fine line between evangelism -- or belief -- and zealotry; zealotry causing people to justify actions that they would otherwise not do, or which historically the very religion which they are professing to follow tells them not to do. In the final movement of this piece, I think Lansing does this brilliant thing where he sets this text about reaching a point a kind of enlightenment. But the way he writes it -- the baritone solosit gets more and more emphatic, like he's preaching; it gets higher and higher until he basically becomes a zealot in front of our eyes, preaching about this topic. So while it's not a narrative story, it's an expression of these feelings. Yes. And observations about how we treat each other. Right. The oratorio begins with this mantra: 'I need nothing. I feel nothing. I desire nothing', which recurs later in the piece. That's used in a kind of quiet ironic way, because it was born out Soyinka's hunger fasts while he was in prison. In a way, it was born of his own zealotry of trying to do something extreme to make his point. How does the choir approach this kind of work? Because it's evocative. And you've told me before, the text is extremely important to you in all your work. Well, first of all, I'm lucky enough to be surrounded by artists who really want to investigate topics like this. They have a really clear command of the words they're saying, because one of the fundamental issues for this art is: who has the voice and how is it being used? And it's something that we take really seriously, because as a new music choir, we have a voice and people listen to it, so we have a huge responsibility. Wole Sinka has a voice and Lansing McLoskey has a voice. What does it mean for us to say their words, or to sing their music? So what is the composer after, ultimately, in this piece? Is there hope? Well, this piece is not going to make people go out and solve world peace; that just isn't going to happen. And I don't believe that art has any possibilities of that, or it would have done it long ago, right? But it might allow us to consider the way in which we speak, how we talk, how we listen. Maybe how we treat each other, just by being reminded in an emotional context, not just reminded of it because somebody says you should be good and not bad. There's so many things going on in this piece -- between poetry, and history, and a kind of personal documentation. And then the language of music, which enhances all of that, creates emotional context that wouldn't be there otherwise. So the answer [to 'Is there hope?'] is yes. Well, congratulations on this new recording. One of our missions is to record all our commissions with the composer in the room. You know, it's a very lofty goal and it's an expensive one, but I really strongly believe in this, and so does the organization, the staff, board and everybody involved really believes in that mission. Praised as "champions of new music" by The New York Times, and now with a third consecutive Grammy nomination, The Crossing performs highlights of a new work by composer Gavin Bryars in our performance studio ahead of concerts on December 14th and 16th. WRTI's Susan Lewis is host.